Picture says it all. Scoop got one of these fancy pages when he won the ‘Pixie Prix’ last weekend, what us locals call the Performance Grand Prix. And his performance team with my friend Mia Grant & Vic won the Team event winning every single one of the 5 classes in overall points. Yep. The PERFORMANCE classes. This was the first time 6 year old Scoop and I competed in Performance. He measures into the 26 inch division and has been competing there since he was 18 months old. Over the years I would say he has been competitive locally at 26 inches. He’s won many local GP’s and a Regional GP and our share of DAM Tournaments as well as local and Regional Steeplechases- when we are lucky and the bars stay up, and of course- if I handle him correctly. 🙂 In March this year we finished second at the AKC Nationals at 24 inches, just .02 seconds off the winner. But at 24, not 26. Scoop takes off early, especially on spread jumps and the table. This past year he has had some spectacular table crashes in both USDAA and AKC. I dreaded the 24 inch table. At least when he creams through a spread jump the bars are displaceable- not so those big unmovable metal tables. The feeling in the pit of my stomach when he hit those obstacles is horrible and frightening and at some point I know he could be seriously hurt. It was hard to finish a course after those crashes with tears filling my eyes and a knife in the pit of my gut. My stress over the decision was all to naught. Last weekend was so freeing, so much fun to let him jump lower with no spreads to crash, and I know the decision was the right one. It was wonderful to walk a course without worrying about how to help him over those gigantic spreads, and not even giving a second glance at the low table. Anyone whose dog struggles with jumping has these concerns and worries over balancing up what we WANT to do with our dogs, and what we SHOULD do with our dogs. For me, last weekend I knew I made the right decision for Scoop’s mental and physical well-being, and certainly for MY mental health as well. And to top off the joy of the moment, Scoop got re-measured two weeks ago at an AKC show and easily got two measurements that moved him from 24 to the 20 inch class. I was sitting with friends on day two of a three day show, whining (yep, sometimes I do that) about how he had crashed almost every triple two weekends in a row and I had tried everything in my arsenal to help him to no avail. A friend suggested I get him re-measured. Scoop’s AKC measurement at 18 months got him just over 22 inches and at the time I was fine with that: 24 inches in AKC (as well as Nationals) and 26 inches in USDAA. No problem- until it became one. I had never measured Scoop again, and I believed he was just over 22 inches tall. Moments after this conversation I walked over to a measuring judge who just happened to be available, and she got him at 21.3/4. 20 minutes later I asked another judge to measure him and she had him right at 22. Within a half hour our competitive life was changed. No more 24 inch spreads and tables for Doobie! I believe Scoop jumps early because he is somewhat cross eyed. His strabismus has been noticeable since he was a puppy. He has always struggled with jumping but for some years I believed it due to other kinds of health issues. Maybe there are other unknown factors as well as strabismus, but I think the biggest factor is that his binocular vision is off because of his eye placement. I can only guess that his depth perception is inaccurate and that is the biggest underlying cause of his Early Take Offs. I am working on an article right now to update everyone where we are in researching the causes for Early Take Off. Not all dogs that take off early for jumps have strabismus.There are likely at least a few causes for ETO. You will notice I am referring to this problem as “ETO” not “ETS”. We do not know if there is even a syndrome to be found- so Linda Mecklenburg, the ETO researchers and myself have begun using the acronym that actually describes the problem. So ironic that I started that project long before I suspected my own dog to be affected. But I’ll save that story for another day. My long post is over, but happily not Scoops’ agility career and all the fun times ahead for both of us playing at our favorite game. Have a great time Scoop and Nancy. In the end, it’s about doing what is the best for our dogs. Moving Sierra to preferred at age 9 was the best decision that I ever made. She had no issue at the time with the higher 20 inch height but it was quite noticeable how much better she landed when taking a 16 inch jump – Less stress on her front and neck! As our dogs get older, their rears do atrophy some and thus doing cross training and swimming is fabulous, as is making their jumping task a bit easier. Sierra ran for 2 great years at preferred and we had a blast, as I hope that you do in performance with Scoop !! I hope that more folks give performance/preferred a try to see how great it is! I have a lovely BC, Brinkley, who moved to 16″ when he was 7. He had arthritis in his toes and as much as I felt that we were being demoted at that height, I soon found out that he was having such a great time and yes, there was plenty of competition and plenty to learn. Actually Mia was the one who suggested it. It was the best decision! So many of my competitors followed me to save their dogs as well! My aussie was measured at 22 & 1/4″ back in the days when they only took 1 measurement. 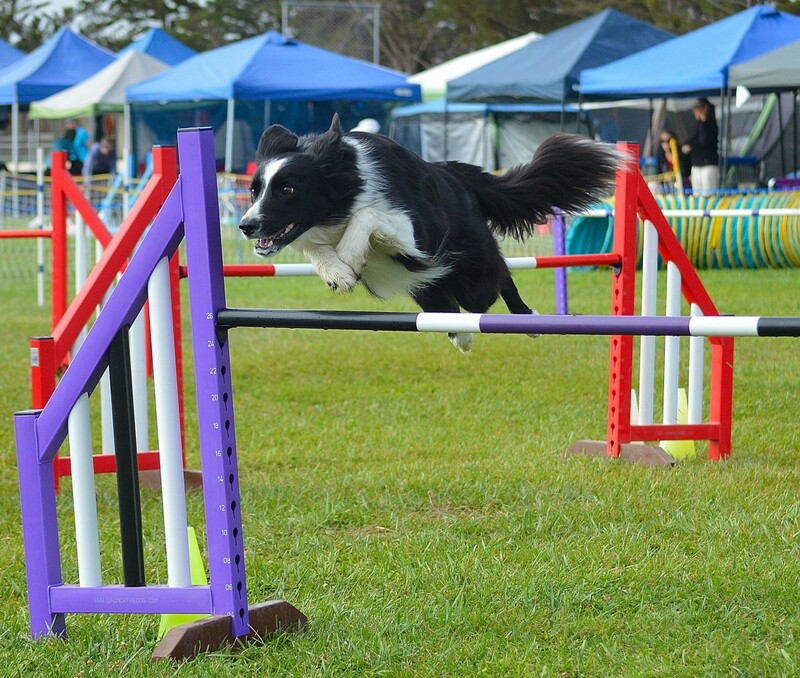 He was jumping 24″ & handled it ok, and to be honest, I had a much better chance at placing in that class then the 20″ with all the border collies, so I thought nothing of it. A couple years later I was at a trial in which the secretary did not have his “height card on file” and I was forced to re-measure…..crazy cause I was jumping 24″ why do I need to be measured. Well, low & behold he got measured at 21 & 5/8″!!! Being able to move him down to 20″ was clearly easier for him & I’m sure allowed us to compete & have fun for 11yrs (the last few in preferred). I think we should all be aware & re-measure our dogs from time to time. Yeah, whoda thunk! no harm in remeasuring and sometimes a great benefit comes your way. I really appreciate seeing this. I did one trial at 22″ with my 18 mo and made an immediate decision to run P20. When she measured into the 16″ class for AKC at age 2, I dropped her to P16. She continued to struggle and crash so I took months off to work on jump training while also considering permanent retirement. Today, I am driving to VOSM to have her assessed for medial shoulder instability. Although she came up acutely lame during a hike, I fear the seeds of the injury may have been planted by her crashes. It’s a tough thing and I wish there were less stigma against handlers who choose to run young dogs in Performance for whatever reason. I actually encourage students to run P because of a frame height. Lisa, I hope she is ok! There should never be a stigma in doing performance classes, but human nature is a strange beast. 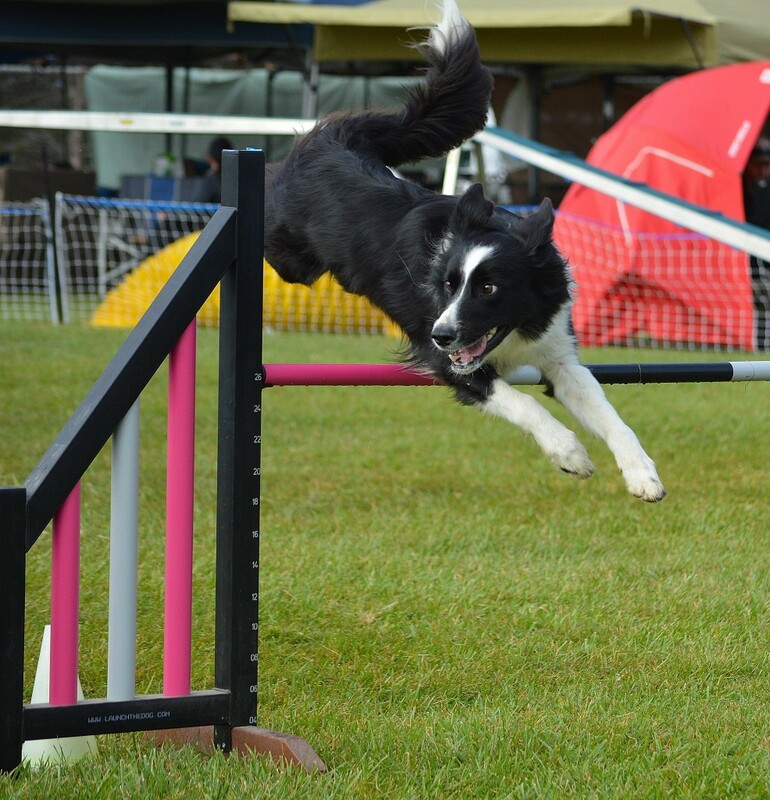 I recently had a student start her dog in novice pf so she could jump the lower heights which are appropriate for her dog who can struggle over jumps at times, and she said she was somewhat chastised by a few handlers for not entering Championship. ridiculous! It is no one’s business but ours. I went through the Perf-or-Ch decision with Tika when she was only 8–still running fast, still making jumps, no ETO, but coming up sore more and more often during or right after a trial (not always–but enough to finally decide that it wasn’t just a random tweak, so went to the vet). Xrays confirmed that she had arthritis in her neck and lower back. I do watch my title counts, and I know that it would be better to not do so, but she seemed to love being out there with me and running and jumping like crazy and I LOVED watching her do the courses. I cried because, you know, “all my friends have their platinum ADCHs” and moving to Perf meant that I’d never ever get that on any other dog, because she was so good. It was a personal thing, so true…but I like you it also hurt because I was sure that this would just be temporary–if she had arthritis, she’d soon be done with agility completely, and I SO wasn’t ready for that. She was only a few Qs away from silver, or had finished, in all her classes, so I moved her to Perf in each as she finished them. The surprise benefit to me, then, was that I stopped thinking so much about titles because I thought that she’d be completely done in only a few months. The surprise benefit to her was that she started running like a young dog again, didn’t get sore, and started pulling in Qs and ribbons against some pretty tough competition! In fact, my other surprise benefit was that we blasted through all of the performance titles and were less than 20 Qs away from that coveted platinum when heart disease sidelined her suddenly at 11. I’d never dreamed she’d like that difference in height so much or that she’d be able to compete that long comfortably, as big as she was. I don’t really have much of a point, except that, yes indeed, I understand the feeling about it being a physical milestone that one doesn’t want to see because it means essentially that the dog is moving on towards being an old dog. A new lease on competition life is a wonderful thing. Glad we both made the right decisions for our special dogs! Thank you for giving voice to this issue Nancy. While I would never put myself in the same class of handling as you, I went through a similar gut check when it became clear that Esti wasn’t visually reading 22″ inch jumps the way that she should. I probably waited a good 6 months later than I should have to move her to performance, but I can honestly say it was huge for us, and likely kept both of us in the game. That extra margin of error just totally transformed the game for us, allowing me to just handle without having to baby sit EVERY difficult jumping scenario. I was happier, she was happier, WE were happier. While in some venues preferred felt a little less competitive due to the relative dearth of dogs, I NEVER felt that way in USDAA. P16 is full of both consistent veteran dogs and young talented dogs, that always required we bring our A game. Do I wish sometimes that we could have rocked it in championship? Sure. But so glad I swallowed my manly pride and moved her when I did. Welcome to the Performance family! Hi Nancy! I have Jean’s Spec’s sister Icee. She too has jumping issues. Icee is 12 3/4″ so has been in the 12″ in AKC and performance in USDAA. In June I dropped Icee down to 8″ to try and get her qualified for AKC nationals. It surprised me that Icee dropped more bars @ 8″ than 12″. She still stuttered @ 8″ but not quite as bad but had more bars. If she takes jumps at an angle she seems to see them and not stutter as much. I feel its the same with with the spreads – she can clear them okay. My question is have you seen many dogs that do NOT jump better at a lower height. Icee does not have a lot of miles on her so there is not a lot of wear and tear on her body. She still loves the game but I feel bad that she struggles at 12″ but drops more bars @ 8″. Any suggestions? Some dogs will jump early and stutter at all heights. I watched Scoops videos from his first time in AKC at 20 inches 2 weeks ago and he did indeed drop his head slightly before the spreads. If the dog jumps the very same at any height then the justification for jumping lower would only be in lowing the risk of crashed bars/tables/tires etc. Crashes lower a dogs confidence, and then I think you might get more extreme stuttering. This is why I often hear that the reason dogs have ETO is that they lack confidence, when it is sort of the opposite. I would possibly stay the course for a while at 8 inches and see if things improve, and if not, then you can choose the height depending on the organizations/ the location of the event and if your dog does better in certain lighting or footing situations etc. I think over time most dogs do better in USDAA performance vs AKC preferred because there are no spreads in USDAA PF. Some near sightedness. I’ve also been told that as he adjusts to a lower jump height he may start having the same issues. My instructor Megan Foster has been working very hard to help us. Incidentally she has had quite a bit of success running him but says she has to really work hard to show him the jumps. So maybe lowering the jumps is not the answer maybe it’s being a better handler in my case. He is 8yrs old now. I don’t think I’ll be getting another dog for fear of having the same issues and it’s been so difficult as I think you can understand from reading your post. You are an AMAZING handler. Thanks for letting me get this out it brings tears to my eyes just to write it. I have learned to see challenges such as this (a dog having issues that could be helped by the handler making a difficult choice) as lessons we are meant to learn. In every case when i have had to face difficulties in my dogs’ performance, i have (eventually!) become a kinder, more patient person who is a better trainer because i’ve had to step back & ask myself “How can i solve this problem in a way that is most fair to my dog?” It can be hard because sometimes i have to let go of what *I* want — or what i think i want — but it becomes easier when i see the long-term results. Dogs are such great teachers. Nancy, do you have any observations with ETO and the long jump? The long jump is the widest spread jump of them all & yet it is still included in Performance. In my experience, Performance could be more friendly toward dogs with ETO (for whatever reason) if “no spreads in Performance” was really true. I have not noticed typical ETO dogs as having a problem with the broad jump. And not that USDAA is catering to dogs with ETO, there are so very many reasons that dogs are entered in the PF classes. I am going to ask this question though to an ETO conversation group to see if anyone has thoughts on the long jump. thanks for bringing it up! PS, I asked the group and did get some response that dogs with ETO do often struggle with the broad jump. Time to bring it to USDAA’s attention that the broad is indeed a spread! 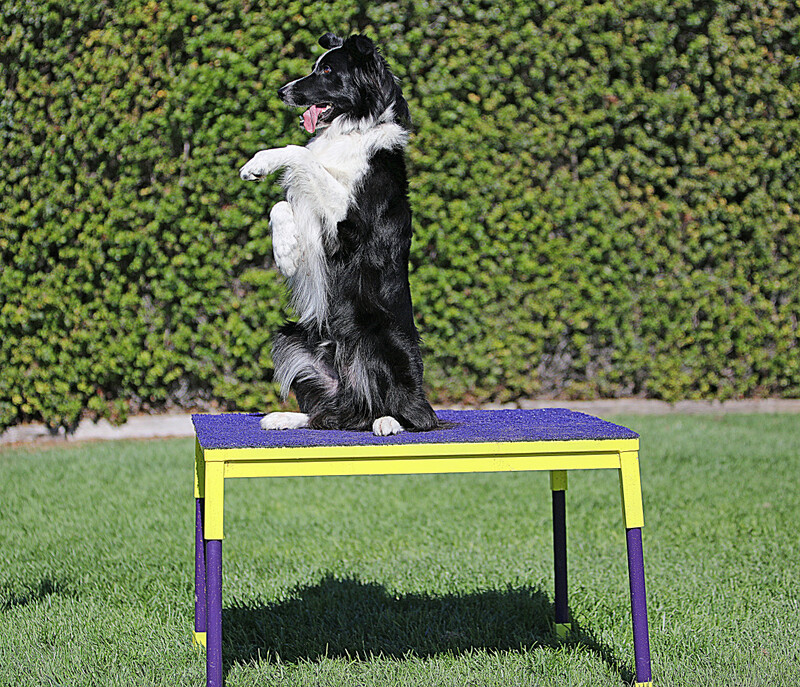 The broad jump is a HUGE problem for Wit and virtually all of the severe ETO dogs who train here. I’m sorry to hear that you feel Performance is a “less competitive form” of agility. Rather, it could be considered as a safer form of agility with the same course challenges. I feel like people are losing sight of the importance of a dog’s health and longevity in this sport. I don’t really believe that spreads and a tall aframe make agility more competitive. Why would it even be a question if a dog is constantly crashing into obstacles? I’m disheartened to see the trend this sport is taking…..have we forgotten the dog because we are lost in our own goals? I am sorry my post came off this way to you.- I certainly did not mean to demean the PF classes- yes the handling challenges are all the same -it is the physical requirements that are lessened. Entering a less physically demanding area of USDAA IS the right thing for my dog and I. Prior to entering PF I was mostly saddened that Scoop had to enter a “less physically demanding” class in our sport. This not a comment about the performance classes- it is more a comment that I wish my big gorgeous dog did not have ETO, and that he could physically and mentally compete in the more demanding class. 2 years ago I moved Ace to the performance classes- he was the third of my dogs to move from CH to PF when the time was right. I cried the first time I ran him in PF, not because I had to run in what is considered by some a less competitive class, but because this also was a milepost in my dogs lives that signaled the bulk of their long competitive agility career was behind them and that they really would not compete and live forever as we all dream. I see more and more teams entering PF with their young dogs, and think PF is getting more competitive not less. I encourage my students to do the same if I feel it is the right thing for their dogs. I might also answer this question with a question, What makes the PF classes competitive? it is the level and number of great teams that enter the class. The challenge of doing well when basing our performance not just against our personal best but against others personal bests is what competition is all about. As PF classes get larger, they ARE more competitive as we all try to do well against the standard and against our fellow competitors. 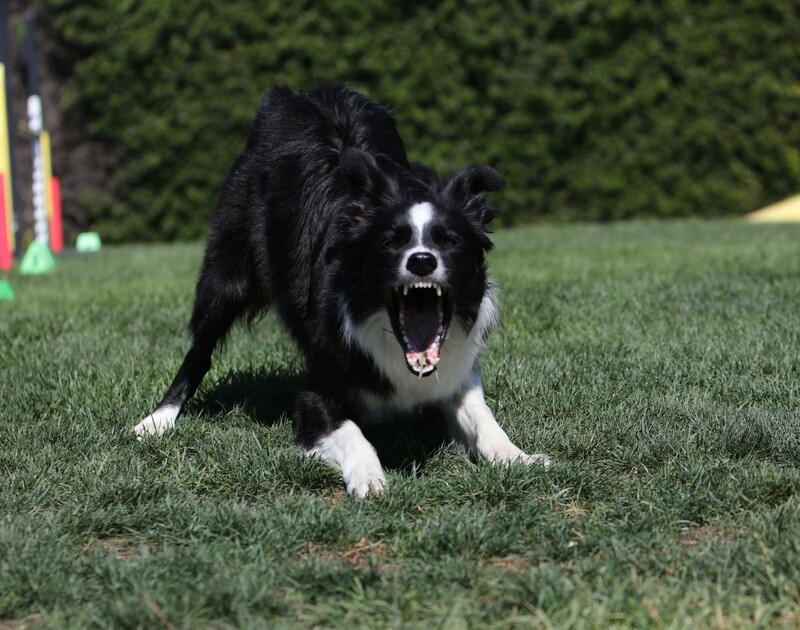 Totally GET how you feel having experienced ETOs in three different dogs. With my first….I moved her down in height pretty young, and when she hurt herself twice in a couple of months, I retired her. At 8 Spec was happier, fast and safer at 8″ than 12″….so she’s only doing 8″ now at 9 1/2…..and we have been having SO much more fun!!! And….the hardest one….Cheer with minimal sings (but certainly signs)….giving up on FCI because she just wasn’t comfortable at 18″ the one year she made the team as a 4 year old. In hindsite I will say though it was a great decision for Cheer….because at 8 she’s still pretty competitive at 16″. I feel certain if I had pushed the 18″, her confidence would have been ruined. As it is by giving up the big dream, we got to experience many other big dreams. And….when she’s uncomfortable at 16″, we will find things to do at 12″ for as long as she can do that safely. Congrats to you and Scoop! I know it was a difficult decision, but so glad you’ve found even more fun to be had. Thanks for your research and energy into this frustrating jumping issue. Thanks Jean, you have been uncommonly unlucky in having 3 with ETO- but now you are uncommonly educated on how to best help your dogs and when we share our experiences it helps others have longer careers. Thanks for your comment! Great post, Nancy. I went through the very same thing with Jemima two years ago when she was 7. She was still flying at 22″, but her times were slowing a bit. I was also bothered by the fact that she has mild arthritis, although I could see no outward signs. My decider is so broken that we were halfway through the qualifying year before I moved her down. 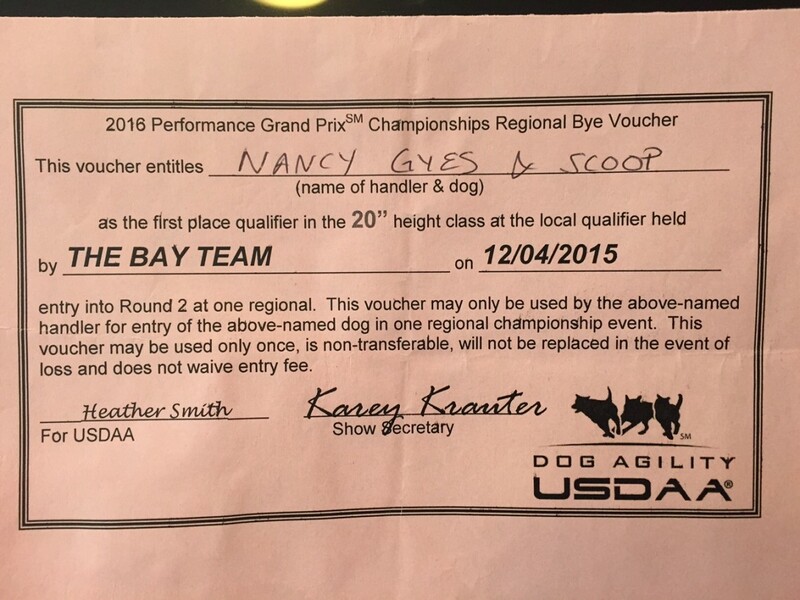 (A side note is that ASCA requires dogs to be 7 before going Pixie and that helped, and their qualifying year ends in May – and I thought it would be best for her to jump the same height in both venues.) Back to USDAA: we needed one more Ch Pairs Q for her Silver ADCH, and earned that the same weekend we chased our first ‘Pixie Steeples’. I knew from that first Pixie run that I had made the right decision. She FLEW over that course, and I had to RUN!!! She’s baaaack!!! I truly believe we will have a longer agility career than if I had waited, and I have never looked back. I am most definitely not a title chaser, I usually know I finished one when the cert arrives in the mail, but some of them are tempting to want to accomplish. For that very reason I decided NOT to look up any of Scoop’s stats in Championship, I did not want to know I needed three of this for that title and 7 of these for that one. I just did not want the temptation to have that sway me from my decision about when and where we moved to performance. See you in the Performance walk throughs! That Pairs run 2 years ago was her last Championship class – nothing else but Performance that weekend and ever since. I told her no more 22″ for you! And I really love the extra super bonus of lower a-frames! Thank you for always setting the gold standard that we should all strive towards, and for sharing your thoughts with us. Have fun Scoop! awww:) thank you for such a great compliment! I love seeing Performance be competitive! If a person feels the lower heights benefit the well being of their dog they should go for it and find just as much challenge and competition as in Championship classes. 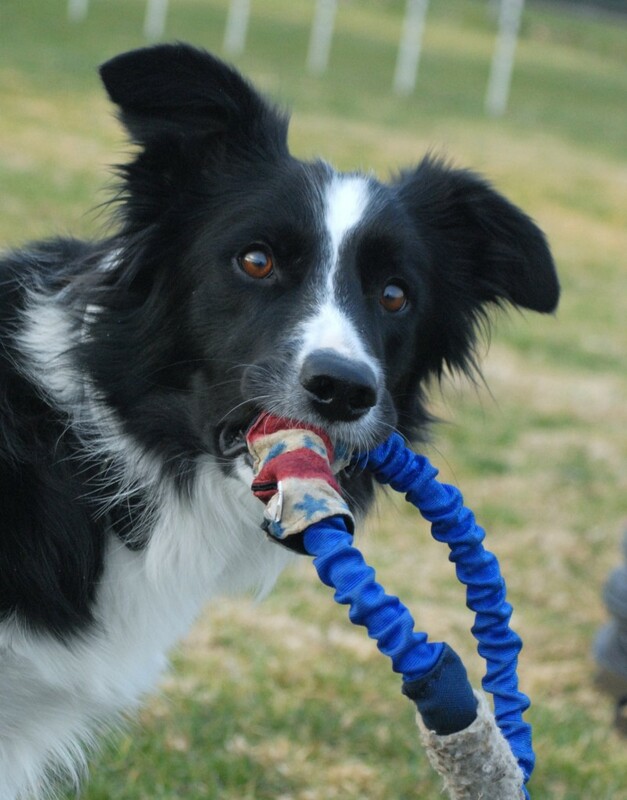 It’s a sport – meant for fun and partnership with our dogs! Thank you for posting this! so agree with you Kathy! yeah, there is a LOT more to life than just agility for our dogs. We all need to keep that in mind- but yeah we can still be sad about missing our sport with our incredible dogs. Kudos to you for putting your dog first and publishing how difficult the decision was for you. Performance 16″ is VERY competitive. I’m very interested to hear more about ETO. Any ideas when the article will be published? I hav a dog that is exhibiting signs of this. He has always had difficulty with the tire and spread jumps. I compete mostly in USDAA Performance so he rarely sees spreads in competition. Lately I’ve been seeing stutter stepping at single jumps. I’m still investigating the possibility that it may be physical, but if not I need to figure out how to help him. He is only 4. I will do a blog post after the holidays bringing everyone up to date on our research projects and what we do and do not know about ETO. Such a refreshing post, especially coming from someone at such a competitive level, truly putting their dogs needs first. I have a dog that still jumps well, but has had chronic neck and wrist issues most of her career and I cringe when she hits the high frame in usdaa. I have considered putting her in performance even tho she is only 6, but I’d like to extend her agility time without contributing to her problems. And I keep chastising myself for thinking of putting her “down” from championship. I understand the decision dilemna. Thank you for the post! yeah, it is a hard decision! One thing that helped me is giving myself permission to move back to Championship if I hated performance. I know now I won’t move back to Ch classes, but when I went into it saying ‘I can change if I want’- it eased my decision. I say try it out and see if you like it! Thank you for this post. Wanting to do what is best for my own dog. Silly pup measure 16.25. Right now he can do it, but it is for me to decide for him what is the best for him for the long haul. 16.25? so frustrating to get a measurement like that. Have you tried again? Exercise before measurement, relaxing with massage and calming exercises, the right judge that your dog is not nervous about, etc all might help to get a true measurement.